At the end of May I visited London. I posted about it once before, in an Art Tuesday post wherein I shared some pictures from an Impressionist exhibition I saw. You can read that post here. Though this is technically a book blog, one thing you should know about me is that besides books/writing, art is my great love, so now and then I like to branch out like a beautiful tree and post about it. 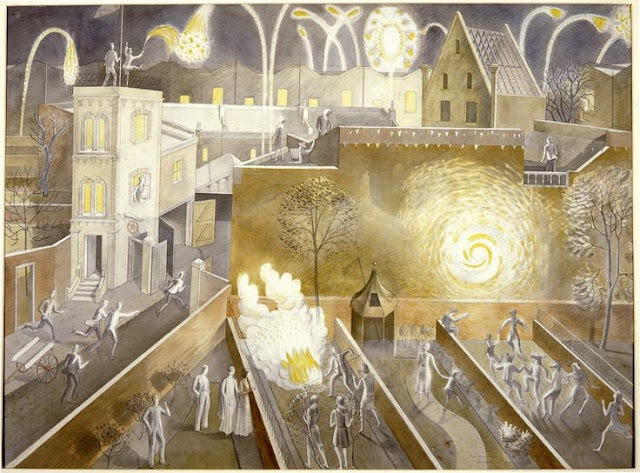 When in London, the other exhibition I saw was of the work of Eric Ravilious. Heard of him? I hadn't, either, until I was Googling "art to see in London" the week before our trip. Going to the exhibition was a bit of a gamble, but I'm so glad we did. Ravilious lived from 1903-1942. 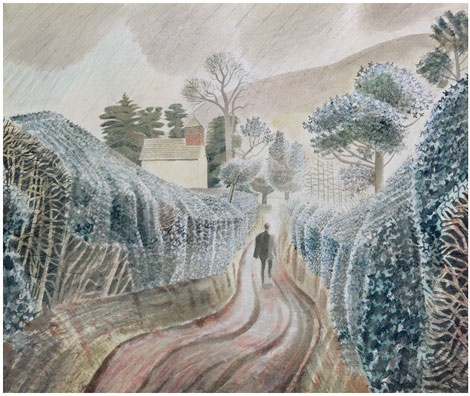 Prior to the twentieth century, all artists painted in oils and watercolours were considered as being only for draft paintings, but Ravilious was instrumental in changing this because he painted almost solely with watercolour; rather than considering these paintings "drafts" they were his finished works. 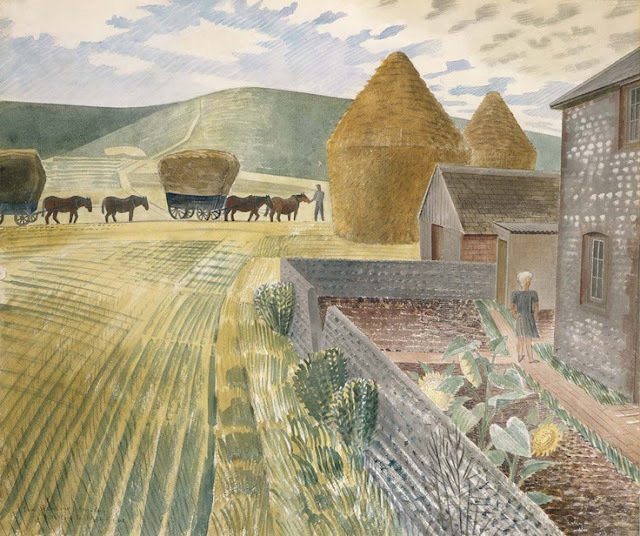 He was particularly inspired by the Sussex Downs and painted a lot of landscapes, reflecting the beauty of England and the tranquillity of rural life. I love this one because I am fascinated by graveyards. The light! It is so beautiful! 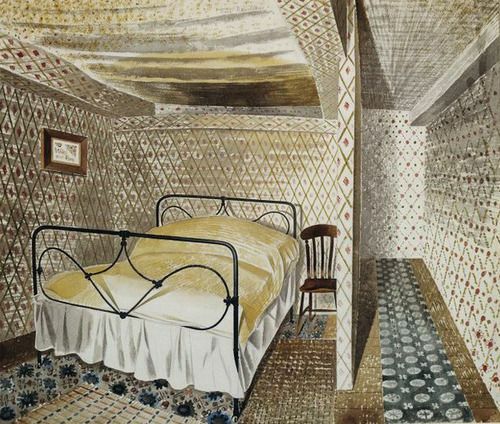 Ravilious also painting cityscapes and interiors. I love how his work hovers between fine art and illustration. This one is quite surreal. The floor isn't quite straight, you see? It is very beautiful, but hard to look at! Again, I love the slightly surreal feel of this, and all the beautiful detail. 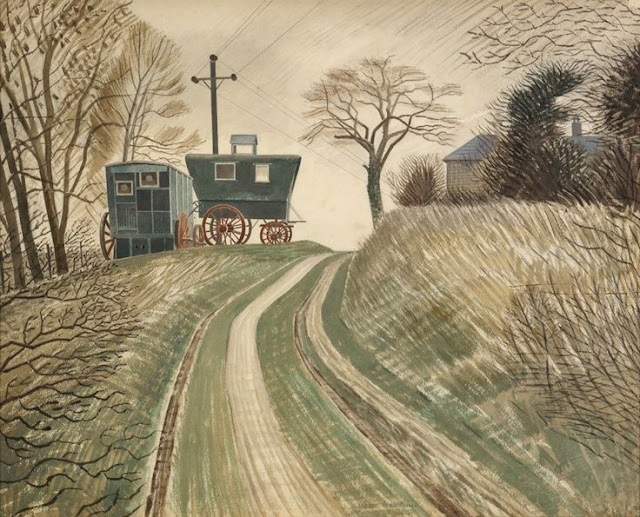 Trains formed a large part of Ravilious' subject matter. 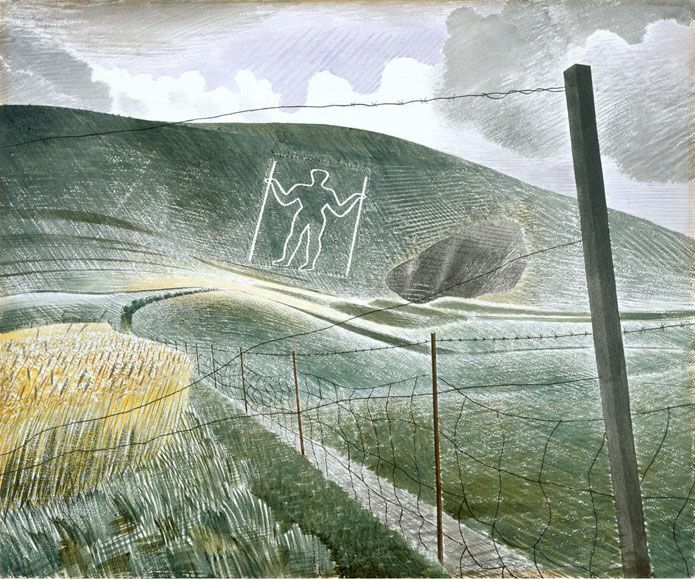 The giant chalk pictures of the Downs often featured in Ravilious' work. 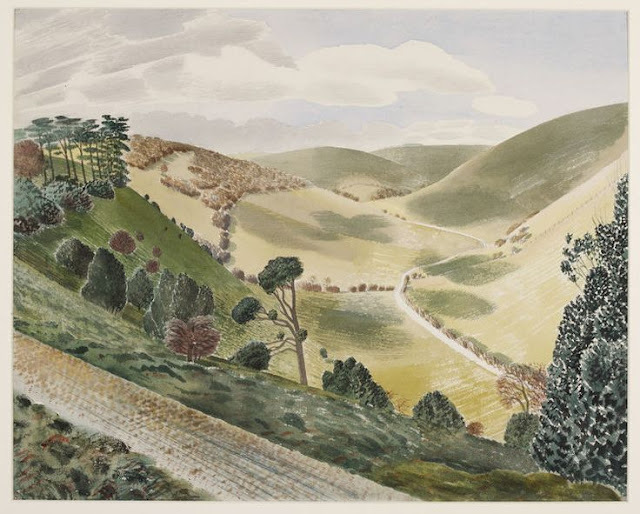 During the Second World War (1939-45), Ravilious became a government-employed war artist, travelling with the British Army and painting what he saw. Whilst today we have cameras readily available at every turn, then the government used artists like Ravilious to document the war. 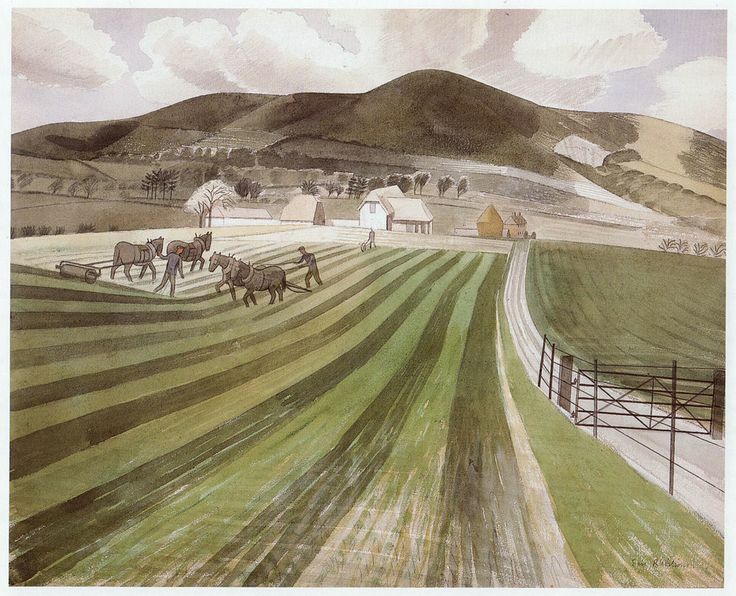 I think it's incredible that his work is still so stunning; even when at war, Ravilious saw the beauty in everything. 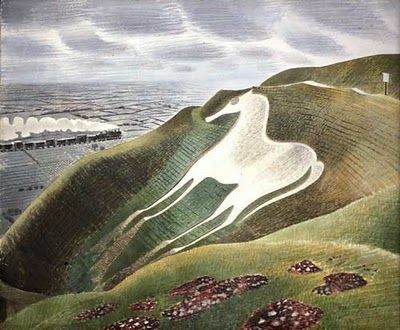 Eric Ravilious was killed in 1942, aged thirty-nine, when the aircraft he was on was lost off Iceland. 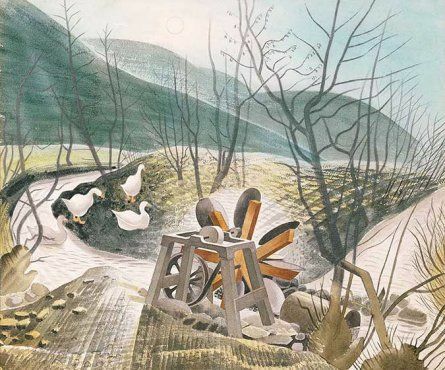 He remains one of the defining British twentieth century artists, for his contribution to the illustration movement; pioneering work in having watercolour recognised as a proper medium; beautiful paintings; and bravery in contribution to the war effort. His work is amazing. I especially love his use of color and his details. Totally. I love the details, too; they give the paintings so much texture. I love this! 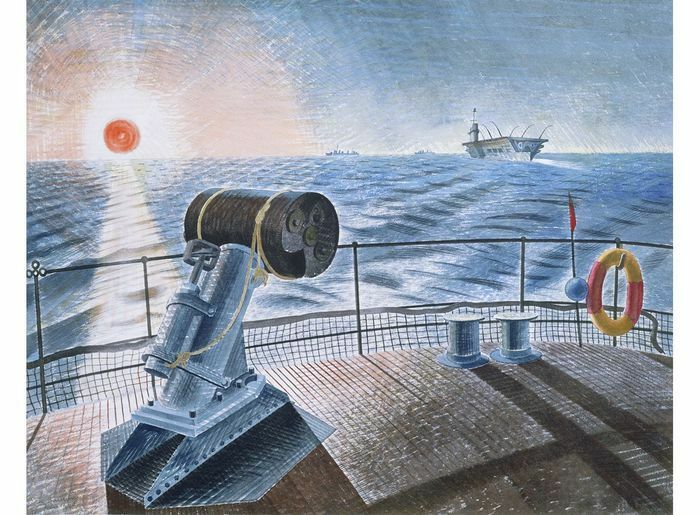 And I think it's really neat how the government used to employ artist to capture the war. They knew it was an important time and that it needed to be noted and they hired painters. 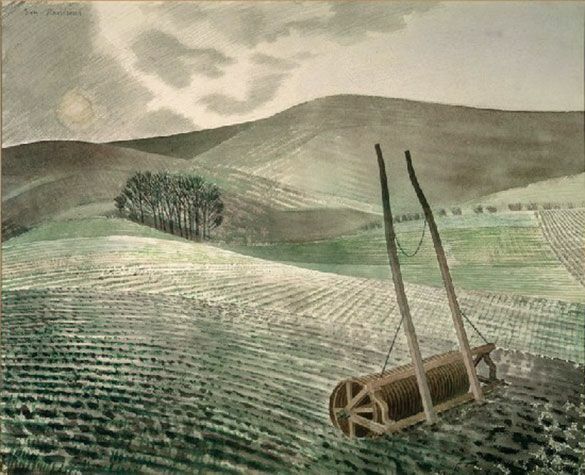 I love Ravilious' skies! They are everything a sky ought to be. I adore The River Thames at Hammersmith! I saw the trees and was internally flailing. Those trees! Wow. I love trees. Also, The Waterwheel. The lighting is so beautiful. If you look at the trees and the general landscape, normally it'd seem like a desolate looking place. But with that lighting, it's something wondrous and lovely. I also like Caravans. I'm not sure why. There's just something small town and travelish about it. That kind of nostalgia you get from days you've never actually lived in, I guess. 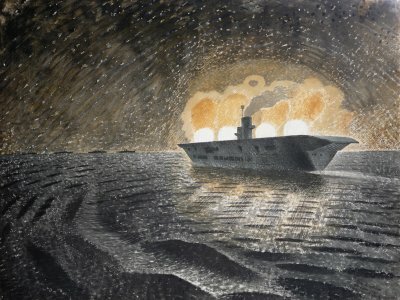 HMS Royal Ark in Action. Again the lighting here. And the water. The lighting makes the waves so distinct in the dark of the night. It's strange, because it's peaceful and yet not at the same time. Like the battle in the back is going on, but the waves just continue with the norm of life. The water has seen these sorts of days before and its just a part of life for it. The battle hasn't disturbed the natural cycle of the world from the water's standpoint. I'm not sure if that makes sense. . . I think so too! Those paintings would've taken him hours, but they still paid him to sit there, slowly shading the sky, whilst the guns thundered in the distance, because they realised it was important. It is very, very cool. They are absolutely beautiful! And yes, that one is stunning! You can just SEE that it's windy! 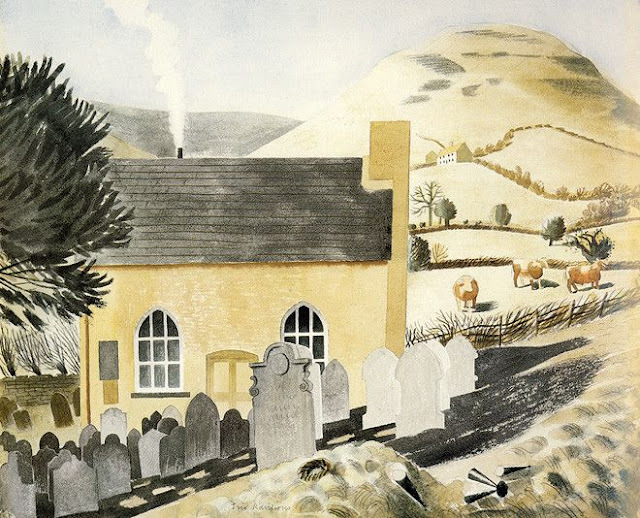 "'hiraeth' -- a homesickness for a home to which you cannot return, a home which maybe never was; the nostalgia, the yearning, the grief for the lost places of your past." Peaceful but not at the same time - exactly! 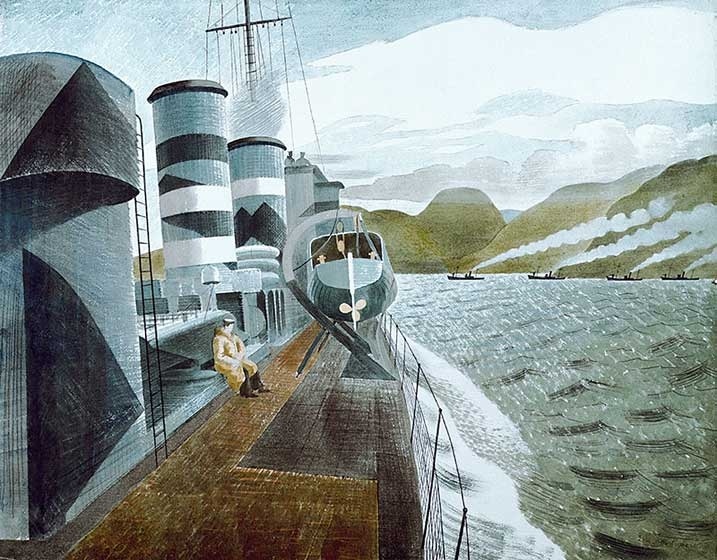 The fiery ship is almost like a star or a comet, as if Ravilious is giving natural beauty to war; ironic and unsettling. And yes, that about the waves makes perfect sense. Reminds me of Keats: "The moving waters at their priestlike task / Of pure ablution round earth's human shores." Humanity may be transient, but the sea remains, always ebbing and flowing, wiping away traces of humanity. The sea is eternal; it's like Genesis 1: "the earth was without form or void, and darkness covered the face of the deep." Before the universe was created, "the deep" existed!! It's mindblowing! Hiraeth. That word! I think I must keep it and treasure it forever. Ah! I love what you say about the waters. Also, I've never read Keats. But I'm thinking I need to get into poetry more. I like it, but it's not normally a first choice for me. Yes! Just like in Genesis 1! I knoooww! It's Welsh. I love it so much. 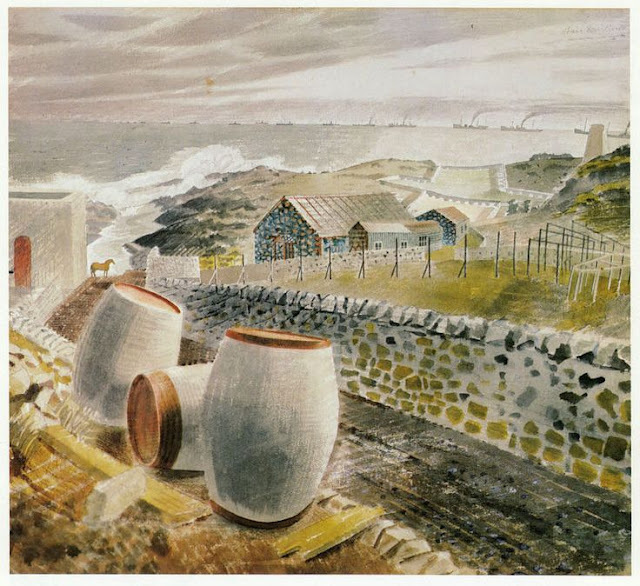 I've never heard of this artist - he has such an interesting story! 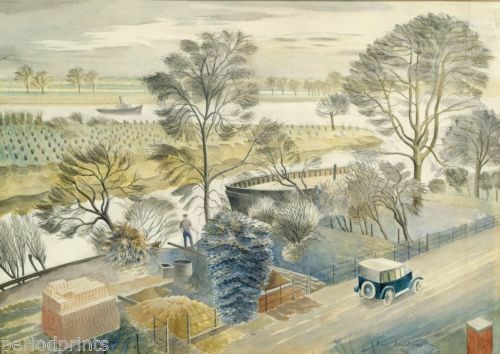 The use of watercolors in all of these pictures is so amazing. 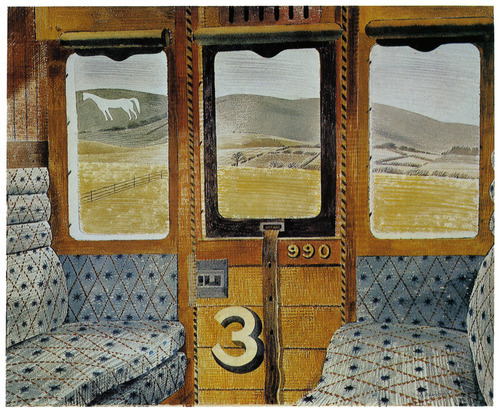 The wartime ones are my favorites, but I also like the landscapes and all of the little details present in each. Great post! I hadn't either, but I've been really moved by his story and the exhibition! 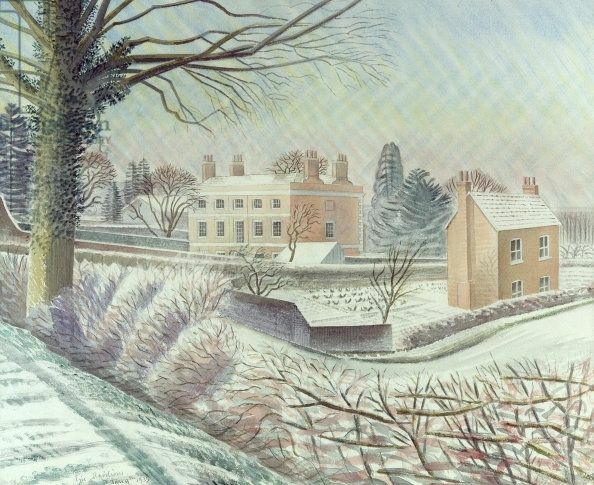 The watercolour is stunning. His style is immensely gorgeous, I agree! His use of colour is perfect, and yes, his composition is genius! 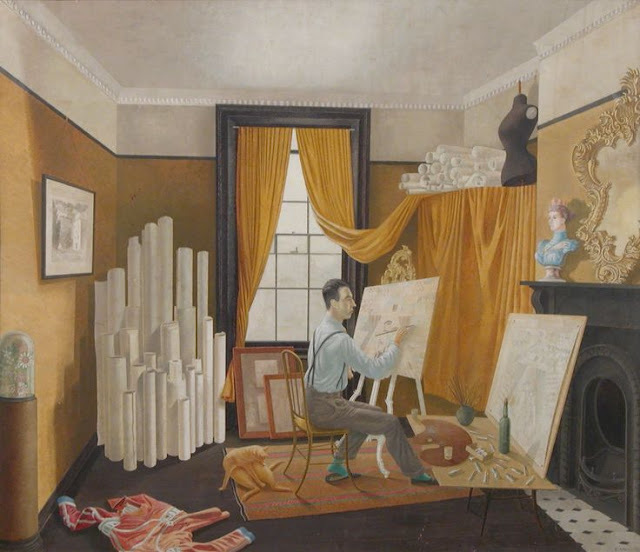 In every single one of these paintings he uses composition to draw your eye right in, so even though the colours are muted the paintings are never flat or boring! November 5th is amazing. I love how even though it's night, the lights are so bright to create such an otherworldly, eerie sense.